Well, it’s that time of year again: time to start thinking about what I will pack for my school lunches–and Ms. Whatsit has given me a perfect excuse to talk about it with her 2nd Teacher’s Potluck Carnival! I’ve varied through the years–for awhile I was bringing yogurt to school and mixing it with berries and cereal, then I went the PB&J on crackers route, but I finally decided I needed something “big” for lunch to make it through the day (my prep is in the morning so from 11ish until 3pm I’m operating on whatever I’ve already managed to eat–I occasionally get cranky 😉 ). I started making “month” long supplies of bigger dishes (burritos, pasta dishes, stews) that I could stuff in single serve containers and freeze. What is my favorite recipe? Eggplant Parmesan! This recipe has stood me in good stead for several reasons. First, it’s not all that difficult to make. Second, because you bake the eggplant, instead of frying it, it’s really not that bad for you (well, except for the massive amounts of cheese). Third, it freezes really, really well. The changes I’ve made to the recipe include adding quite a bit more oregano, quite a bit of fresh basil, and using freshly roasted tomatoes in addition to the canned. It “ups” the taste quite a bit–I also use real eggs instead of egg substitute. If your family prefers milder food, just try the recipe “as is” first and then spice it up as you like. I found the recipe on some sort of “light” cooking show a few years ago–unfortunately, I forgot to write down where! But it still tastes great! Happy eating! Wow! This looks great! I love eggplant parmasean also, but your recipe looks simpler than mine. I like that you prepare it and then freeze it to take to schol. I don’t really do eggplants, but that does look good! I like the idea of freezing stuff to take to school, but I struggle with finding something healthy. I usually end up taking a turkey sandwich and a salad, which is SO BORING and really not all that great. I think you could do this with chicken or veal as well–if you were more of a meat-eater. I agree with the problem w/ boring school lunches. It got to the point where I was skipping lunch because I could NOT face another cracker with PB&J on it. It’d be great to hear about other alternatives though–and of course, it has to be able to be consumed at mach ten within twenty minutes! I can’t wait to try this. 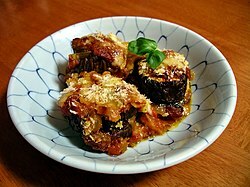 I know very little about cooking eggplant, so I will try out this recipe. Looks easy and yummy!